or laptop without the necessity of using a serial port. The supplied driver for model SIM02 allows the Sensor Interface Module to appear as a USB device for direct connection which can be selected when using Hydro-Com v2.3.0 or later. the plug-in DC power supply in the Sensor Interface Module kit can be used. If however the sensor is already powered, then only the RS485 serial communication wires A and B need to be connected. In this case the spare terminal block can be used. 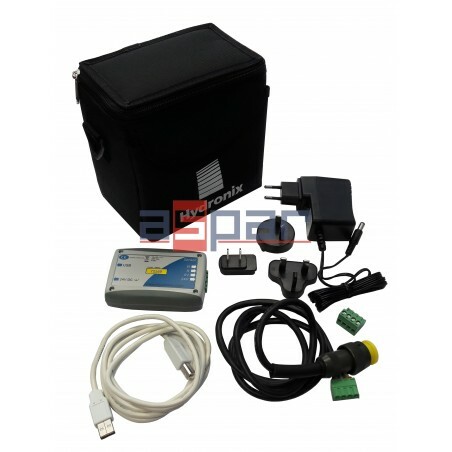 The Sensor Interface Module connects to a USB port on any desktop PC or laptop.The module may also be connected through a powered or unpowered USB hub. As with all USB devices cables should be less than 5m in length. If possible, the USB cable supplied by Hydronix should be used and the Sensor Interface Module connected directly into a USB port on the computer.